Mushroom compost can often be bought cheaply in bulk for use as a soil conditioner or mulch. It is usually available as ‘spent’ mushroom compost, referring to the fact it is the compost left over from mushroom farming. Mushroom compost has a high organic matter content makes it a useful material for soil improvement and mulching. It can sometimes be obtained cheaply and in large quantity from local mushroom farms, soil and manure suppliers, and the occasional garden centre. Traditionally made with well-rotted stable manure, mushroom compost is now generally made using composted straw. Mushroom compost often contains chalk and is alkaline in nature. When using mushroom compost, remove any large pieces of chalk that are visible, and use it in moderation, alternating with well-rotted manure or garden compost, these being only slightly alkaline or neutral in their reaction. This avoids excessive build up of chalk in the soil. Mushroom compost is sometimes offered without having first been used to raise mushrooms and being free of chalk is an ideal manure. Note: there is no connection between spent (used) mushroom compost and the disease honey fungus. Frequent or heavy use of spent mushroom compost usually leads to a build-up of chalk particles in the garden soil, and to increased soil alkalinity. This can occur to the extent that plant growth suffers, the chalk making other nutrients in the soil less available. In severe cases, yellowing of the foliage (known as lime-induced chlorosis) and general stunting occurs, with consequent reduction in flowering and fruiting. Mushroom compost is therefore most useful on acid soils that are low in organic matter, where the liming effect of the chalk is an added benefit to soil fertility. Mushroom compost is not recommended for neutral, alkaline or chalky soils, which would be made excessively alkaline by the addition of further chalk. Mushroom compost is excellent on the vegetable garden, as vegetable crops usually grow best when th soil is not acid and where the soil is alkaline brassicas (cabbage, broccoli, cauliflower, kohlrabi, Brussels sprouts and kale) are less likely to be infected by clubroot disease. Mushroom compost use should be avoided where ericaceous plants such as rhododendrons, camellias, azaleas and heathers are being grown, as these plants need acidic growing conditions and are chalk-hating. 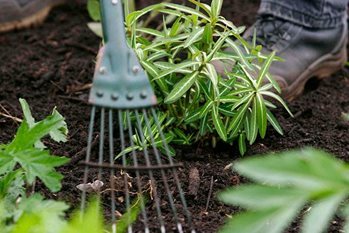 In ericaceous beds, leaf mould is preferable as mulch and soil improver, being pH neutral (broad leaves) or acidic (pine needle leaf mould) in its nature. Mushroom compost is unsuitable for fruit crops (which prefer neutral to acid conditions), and it is not recommended for use as a lawn top-dressing, except where the soil is very acid and a definite need for lime has been established. Mushroom compost contains high levels of soluble salts, so it is better not used as a component in potting mixes. Mushroom compost usually refers to ‘spent mushroom compost’, because it has already been used for mushroom growing. However, a limited number of suppliers also offer un-used mushroom compost. Spent mushroom compost usually contains a higher percentage of chalk (up to 30 percent), as the ‘bed’ on which the mushrooms are grown is encased in chalk. Un-used mushroom compost contains much less chalk and is less alkaline in nature.